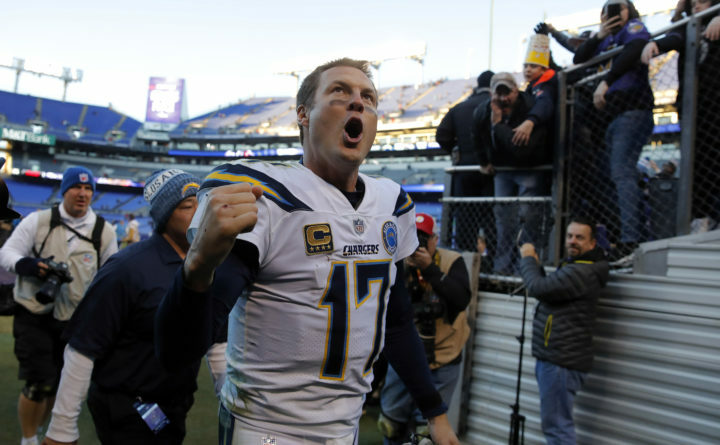 Los Angeles Chargers quarterback Philip Rivers celebates as he walks off the field after an NFL wild card playoff football game against the Baltimore Ravens on Sunday in Baltimore. Los Angeles won 23-17. BALTIMORE — The Los Angeles Chargers’ prize for dismantling the toughest defense in the NFL is a road game against a team that has long been a nemesis for Philip Rivers. “I’m standing there, and they were just like chanting Flacco’s name. I love ‘Flac,’ but [Jackson] got us here,” Smith said. “So for the fact that you’re a fair-weather fan that quickly when things go rough — you turn your back on him? That just got under my skin a little bit. Associated Press writer Howard Fendrich contributed to this report.